When declarer leads a side suit from dummmy in which declarer's length is known, do NOT give count. Keep your singletons and doubletons in the middle of your hand. Some players watch where your cards come from. Don't even think of leading a trump when the opponents are in the throes of a misfit. If it is CLEAR dummy has a void, underleading an ace in that suit usually works. However, if dummy turns up with a singleton and declarer has the king, don't call and don't write. If partner makes a daring underlead and you find yourself unexpectedly on play, chances are partner has a side suit void. Versus suit contracts, tend to make discards from length, particularly KNOWN length. No matter how badly your lead or partner's lead has turned out, no faces! 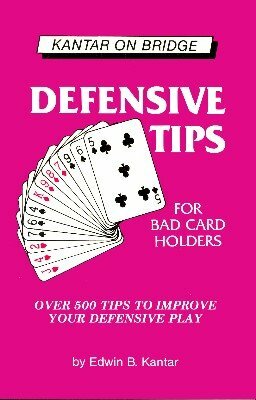 And over 500 more tips to improve your play. 1st edition 1994; revised 2007; 270 pages.